Slate is a fine-grained, homogeneous, sedimentary rock composed of clay or volcanic ash which has been metamorphosed in layers. Slate can be made into roofing slates, because it has two lines of breakability: cleavage and grain. This makes it possible to split slate into thin sheets. Fine slate can also be used to hone knives. Slate is mainly composed of quartz and muscovite (a mica), often along with biotite, chlorite, and hematite, or, less frequently, apatite, graphite, kaolin, magnetite, tourmaline, or zircon.Some of the finest slates in the world come from Portugal, Wales in the United Kingdom, the east coast of Newfoundland, and the “Slate Valley” of Vermont and New York. Weathering slates will change color as they age with most weathering occurring in the first 1 to 3 years but can continue to change infinitely. Weathering slate provides the natural earth tones of bronze, browns, buffs, cream colors which eventually become a blend on the roof. Colors tend to be on the lighter end of the spectrum with light grays, greens which can provide a more natural “country cottage” or “old world” look to a home. Almost all domestic slate weathers to some degree. Non-Weather slates, as their namesake states, hold their colors and tend to be the darker colors of blacks and grays. Non-Weathering slates are most visible on the more formal structures in Georgian and Gothic styles of architecture. Existing slate roofs on residences are probably about 50% Weathering vs. 50% Non-Weathering, commercial (churches, courthouses, universities, etc.) are about 20% Weathering vs. 80% Non-Weathering. This percentage changes on the region. For instance: Weathering is more common on homes in the Northeast, while Non-Weathering slate is more common in the Southeast. Random width is the combination of two or more widths of slate roofing tiles randomly installed to provide a “broken” or random pattern of key way spacing the side space between the slate in one horizontal course. Random width is most common on residential installations and tends to the more natural look. Constant width installations are where a single width of slate tile is installed on the roof. In this case the key way spaces in alternate horizontal courses line up to create a more uniform pattern on the roof and provide a more formal style. Constant width is often seen on commercial projects, churches, courthouses, educational/institutional buildings and large very formal residential projects. 16″ to 18″ random width, 16″ x 8″ or 10″, 18″ x 12″, and 20″ x 10″ constant width are the most common sizes. 16″, 18″ and 20″ random are often seen, but 20″ x 10″ and 24″ x 12″ are more common on large formal projects. The standard thickness of slate is 3/16″ to 1/4″ for smooth textured products and 1/4″ to 3/8″ for heavier textured stone. About 90% of all slate projects use standard thickness, but the other 10% can range from 3/16″ all the way to 1″. 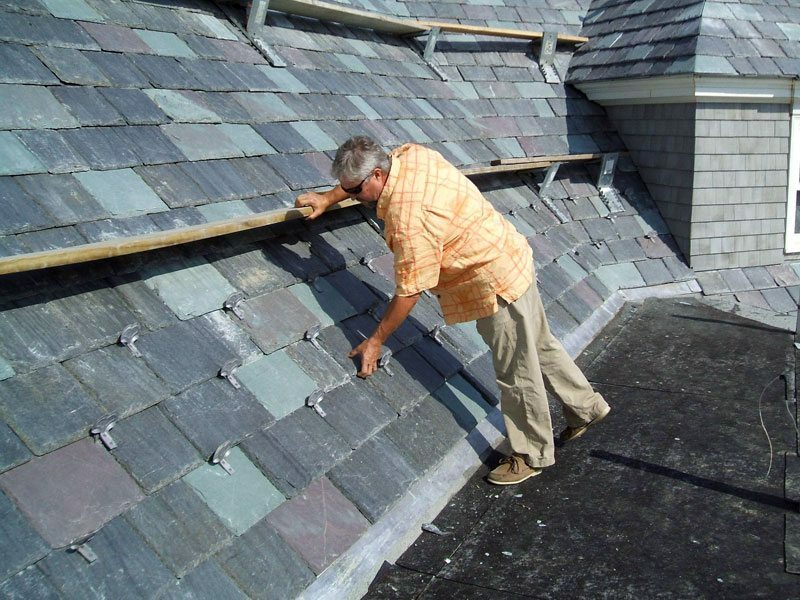 A “Graduated thickness” slate roof is an installation where the lower sections of the slate roof have “heavy” or extra thick slate and then the slate goes down in thickness as it progresses up toward the peak. These installations are somewhat more complicated but can provide a more dramatic texture on the slate roof. “Graduation” tends toward the more natural and is almost unseen in combination with constant width jobs. Weight Consideration: Most homes, where slate is a consideration, can support the weight of standard thickness slate roof with out modification. Standard slate weighs about 8 lbs. per square foot, but varies with color and texture. In situations where the weight is too high, bracing of rafter spans is usually relatively inexpensive. We can provide guidelines and recommend roof structure consultants to determine the feasibility. In the end it is “better to be safe than sorry” so if the house is not designed for the weight of “hard roof products”, it should be investigated. On residential slate roofing projects, 16″ to 18″ random width, 16″ x 8″ or 10″, 18″ x 12″, and 20″ x 10″ constant width are the most common sizes. 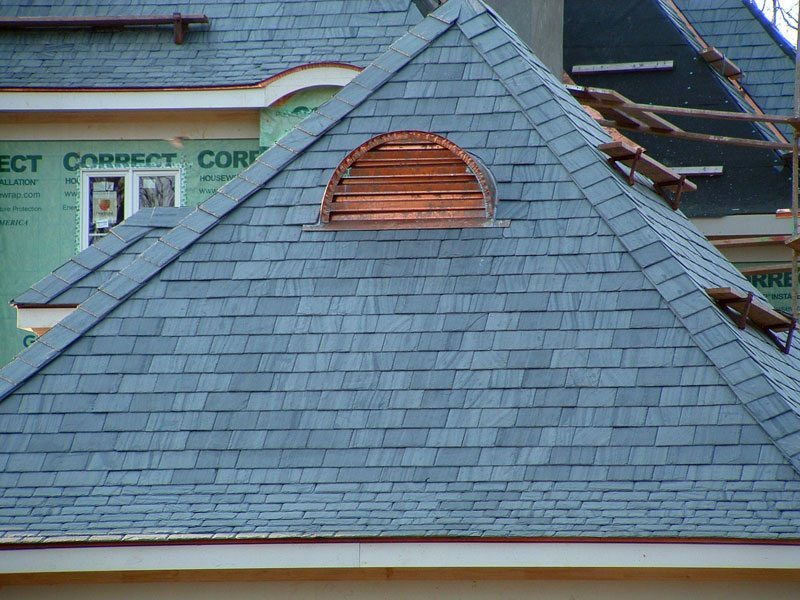 On commercial slate roofing projects 16″, 18″ and 20″ random are often seen, but 20″ x 10″ and 24″ x 12″ are more common on large formal projects. 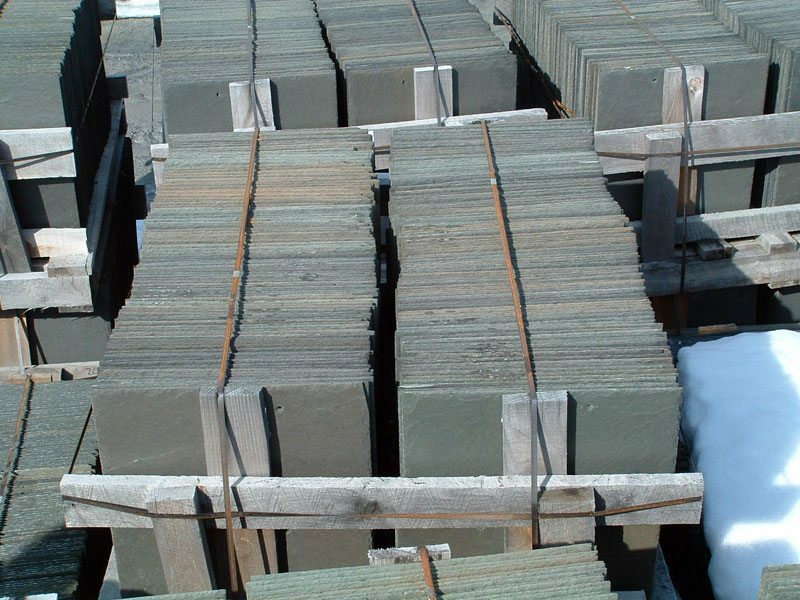 The standard thickness of slate is 3/16″ to 1/4″ for smooth textured products and 1/4″ to 3/8″ for heavier textured stone. About 90% of all slate projects use standard thickness, but the other 10% can range from 3/16″ all the way to 1″. A “Graduate thickness” slate roof is an installation where the lower sections of the slate roof have “heavy” or extra thick slate and then the slate goes down in thickness as it progresses up toward the peak. These installations are somewhat more complicated but can provide a more dramatic texture on the slate roof. “Graduation” tends toward the more natural and is almost unseen in combination with constant width jobs. Most homes where slate is a consideration can support the weight of standard thickness slate roof with out mondification. Standard slate weighs about 8 lbs. per square foot, but varies with color and texture. In situations where the weight is too high, bracing of rafter spans is usually sime and relatively inexpensive. We can provide guidelines and recommend roof structure consultants to determine the feasibility. In the end it is “better to be safe than sorry” so if the house is not designed for the weight of “hard roof products”, it should be investigated. The key to deciding between a domestic slate and an imported slate is really a color decision. Almost all domestic slates weather to some degree due to the small amounts of iron and other elements in the stone. Most imported slate is non-weathering which is, depending on the desired effect, why it is worth importing in the first place. If the earth tones and natural variation provided by weathering and semi-weathering slate is desired, you are better served by a domestic slate. Vermont Unfading Green and Purple are the least weathering Vermont slates and sometime experience none at all that is significant enough to be visible from the ground. If you want a non-weathering black or gray slate, you are probably better served by an imported slate. There are a few crossover products on both sides with a lengthy explanation deserved to understand them fully. We will be happy to provided more detailed information upon your request. You can find good and bad roofing slate in both domestic and imported products, so the key is dealing with a reputable producer like Black Diamond Slate™ and a few others in the slate roofing business. 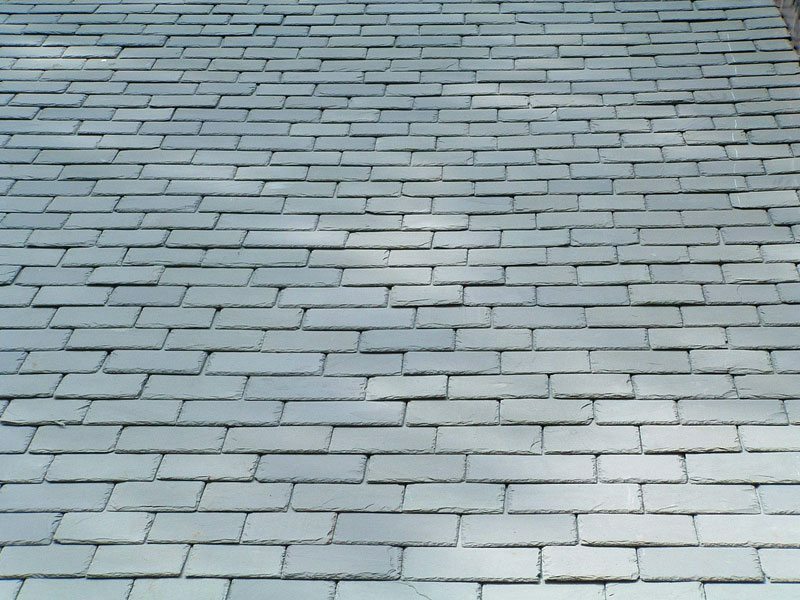 In recent years, especially since hurricane Katrina, used slate tiles have become more expensive due to the high demand for repairs on existing structures where the entire slate roof is not replaced. The result is that the cost of used slate tiles are about the same as new slate tiles. 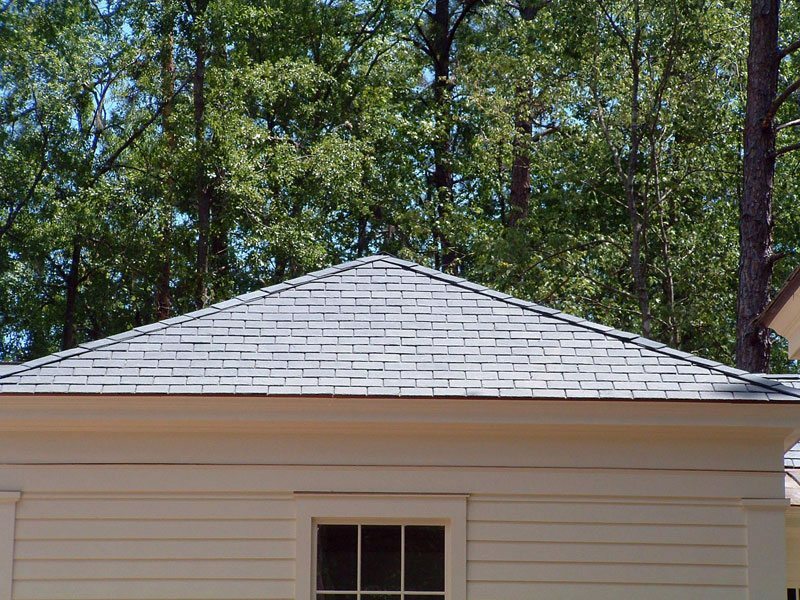 In the case of unfading Gray/Black such as PA Peach Bottom and Buckingham, Welsh slate tiles and Munson slate tiles , the price of reclaimed slate roofing is sometimes more than a new matching slate roof. Even before this was true, we always recommended that new slate tile be used on full replacements or new slate roofs for the simple reason that used slate tiles do not have the same useful life as new slate tiles. That factor is difficult to determine with some used slate roofing unless the origin quarry and original date of manufacture are known. 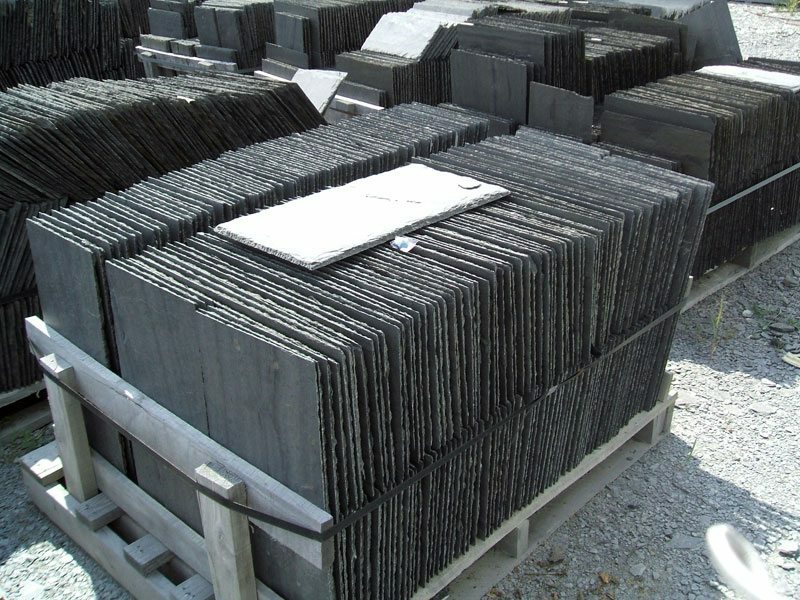 Because of the long lifespan of slate roofing and the fact that slate tiles from many different quarries can be visually indistinguishable once aged, but have significantly different expected service life, there is always an unknown risk taken when reclaimed slate tiles are used. There is also a good reason to use reclaimed slate roofing in the case of partial replacements and repairs. Since the original source of a particular slate involving a repair is usually unknown, the best way to match existing weathered slate is with reclaimed slate. Even slate from the same quarry produced years apart can weather in different ways. Slate is a natural stone with varying amounts of minerals contained in the slate from day to day. The variation is less with unfading black slates, but with Vermont unfading greens, grays and especially semi-weathering or weathering slates the variations in weathering can be substantial. So the bottom line recommendation remains the same regardless of price. When you are replacing an entire slate roof or installing a new slate roof, new slate tiles are the best option. When patching or repairing an existing slate roof where the old slate roof is to be reused, it is best to source reclaimed slate tiles. 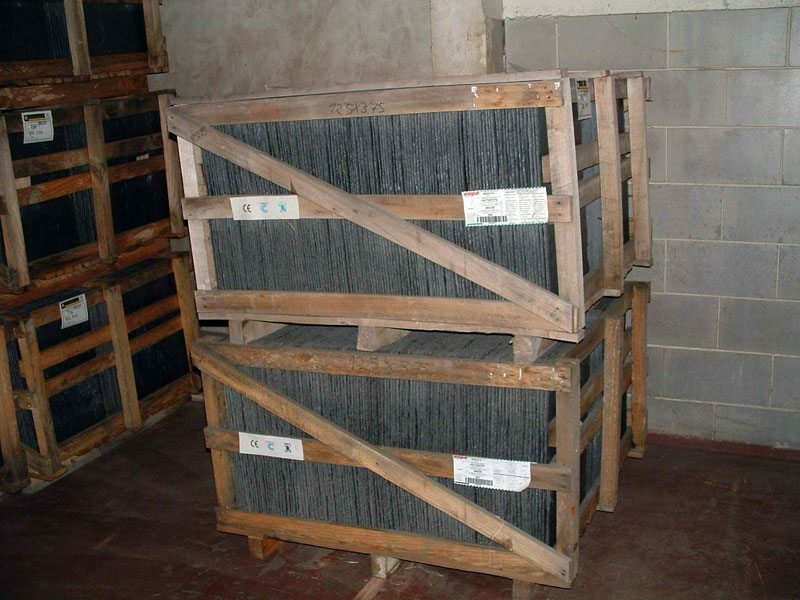 If reclaimed slate is to be used, the material should be evaluated to be sure it is suitable for reuse. The “ring test” and visual inspection are the best methods in lieu of knowing the original source quarry. When held by a corner tip, the slate should resonate sound or ring when struck on the lower portion with a hard object. If the resulting sound is a “thud”, the slate tile is beyond the useful life. It may last 5 or 10 years, but the cost of labor and installation negates the feasibility from a cost standpoint. Slate tiles with a high moisture absorption used in cold climates can show visual signs of delaminating even if it still “rings”. 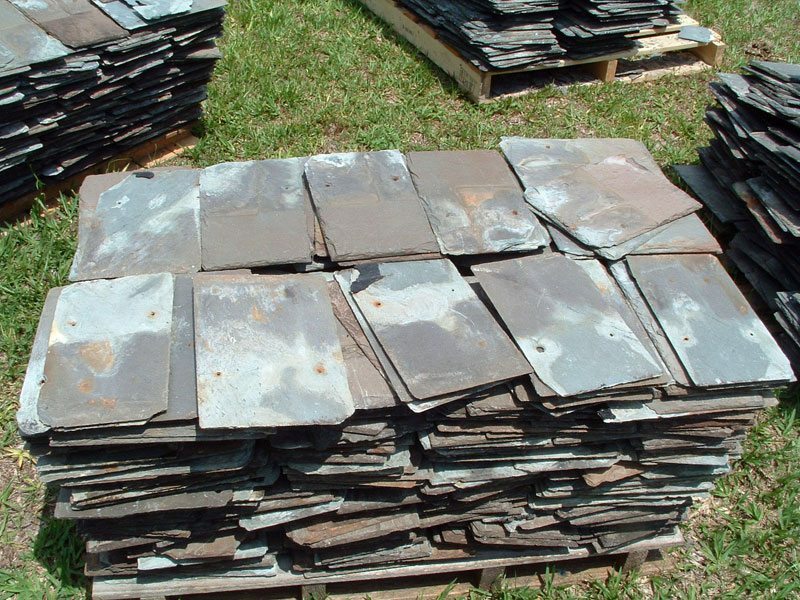 Many of the historic Pennsylvania slates were S-2 Grade with a 40 to 50 year service life and act in this manner. So if the slate face can be easily flaked away, the slate is not suitable for reinstallation. The best advice when using reclaimed slate tiles is to purchase it from, or have it inspected by, someone knowledgeable and experienced in slate roofing and reclaimed slate in particular. 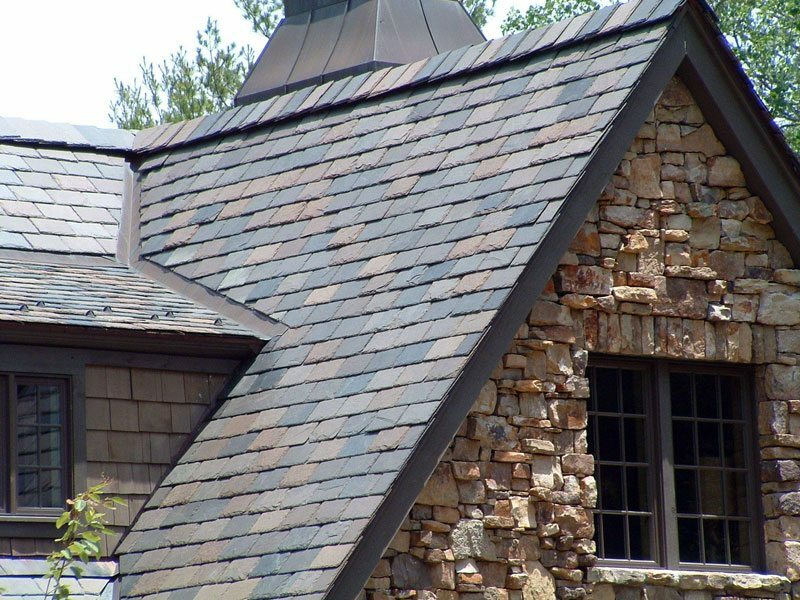 We can provide the names of qualified slate roofing professionals in most parts of the U.S.. As a rule, only consider slate roofers that are experienced in slate, tile or wood shakes. Flashing is the most complicated part of a slate roof, so the installer must be proficient in forming and welding copper flashing. Always get two or three prices as the range in labor costs can vary enormously from one slate roofer to the next. We can provide some guidelines and budget numbers that should be helpful in selecting the installer for your slate roofing project. It is highly recommended to use copper or real zinc flashing with your slate roof. You can save a few dollars downgrading to coated metals, but the savings is marginal because labor is more than materials. You don’t want a 100 to 200 year slate roof with 25 or 30 year flashing. Plus, a good slate roofer will probably insist on copper if he is providing a warranty. 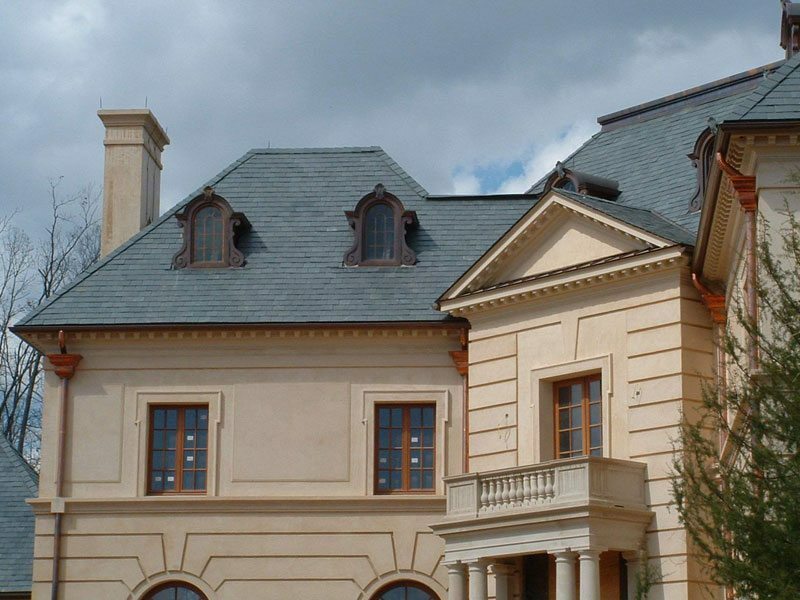 Slate is one of the world’s most environmentally friendly roofing options. It is a totally natural product which has the lowest embodied energy of all the roofing materials. Slate is ideally suitable as a roofing material because its embodied carbon value is at most 16% of that of other roofing materials. Embodied energy is the energy required to manufacture, transport and use the product and deal with any waste created. Slate also has the lowest carbon footprint which is the fossil fuel used to process the product. In addition to being a natural product, slate can withstand fire, hail, acid rain, hurricane force winds, insects, and just about anything Mother Nature can unleash. Because slate is so durable, it eliminates re-roofing every 10-30 years. Some slate roofs have survived hundreds of years! Slate is also reusable and recyclable. Many slate roofs are reclaimed and used on other roofs or used in a variety of artistic and architectural ways.